In recent months, there has been a significant increase in the number of networks and users affected by ransomware known as Locky, which is used to encrypt a victim’s files and then demand a ransom to be paid in bitcoins. But, how does this threat manage to infiltrate computer systems and hijack data? From the ESET Research Lab in Latin America, we can explain the steps and the methods used by cybercriminals to evade various layers of security. The diagram below shows the Locky infection process leading to the payload. Initially, the user will receive an email which may be based on one of a number of topics and in various languages. This email will contain a Microsoft Office document in an attachment (this could be .DOC, .DOCM or .XLS). 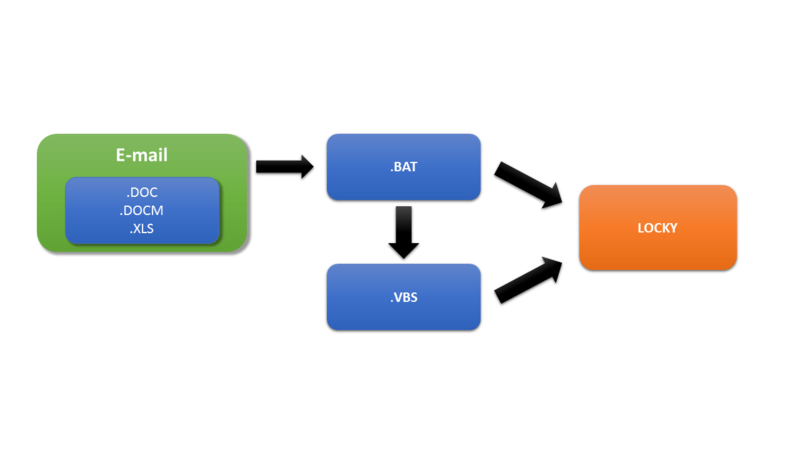 This document creates a BAT file, which in turn creates another file in VBScript code. Between them, these files will later download the main threat, detected by ESET solutions as Win32/Filecoder.Locky. Below we will give a step-by-step explanation on each of the above components and how they perform their malicious actions to achieve their goal. Finally, we will take a look at how proactive detection can protect users. The purpose of the “ugfdxafff.bat” file is to create a VBScript file, which will work alongside it, including a URL to download the payload – in this case labeled as “asddddd.exe”. One of the most important points to remember when faced with how Locky works is to understand that this set of intermediate steps, in which a proactive security solution combined with user awareness and education, will enable the attack to be blocked before it reaches your inbox or before macros are enabled. The acceptance of spam emails by users or company employees is one of the points of entry for this type of threat, so that it can hijack company data and generate a huge problem for users. It is important to take into account the risks inherent to using macros in a Microsoft Office document, as this could compromise personal or work data and files, not to mention an entire corporate network. This is why it is crucial that all users become educated about trends in computer crime and the effects of threats like ransomware. They must internalize best practices in computer security. The main thing, of course, is to use a properly configured, up-to-date antivirus program to avoid this type of malicious code from harming systems. Then information in this article can also be used as advice to prevent ransomware.